On 17 January, the #CopyrightWeek theme is ‘Safe Harbors’. The starting point is that: “Safe harbor protections allow online intermediaries to foster public discourse and creativity. Safe harbor status should be easy for intermediaries of all sizes to attain and maintain”. The negotiations on the EU copyright reform have now reached a crucial stage with the next, and perhaps final, trilogue negotiations taking place on Monday 21 January between the European Parliament (EP) and the Romanian Council Presidency, representing the EU Member States. Ahead of this trilogue meeting, the Deputy EU Member State Representatives are set to vote, on Friday 18 January, on a revised negotiation mandate, which will set the margin of manoeuvre that the Romanian Council Presidency will have to strike a deal with the EP. EP Shadow Rapporteur MEP Julia Reda recently noted that “the negotiators have reached agreement on the core of Article 13, which will change the internet as we know it: They want to make internet platforms directly liable for any copyright infringements their users commit”. The EU is thus planning to impose direct liability on online platforms, which implies that we’re drifting away from the intermediary liability protection (or so-called ‘safe harbour’ regime) under the e-Commerce Directive, towards the creation of the Internet’s own copyright ‘Bermuda Triangle’: one where content will disappear with no one understanding what’s just happened. In our view, should the EU end up taking that route, it is sailing in the wrong direction. To explain how we got caught in this storm, we think however it makes sense to first take a step back to look at the origins of the ‘safe harbour’ regime, in order to assess the impact this change of course is bound to have. The initial discussions on the e-Commerce Directive [ECD] (2000/31/EC) started in the late 1990s, when people were still relying on dial-up connections and using acronyms like ‘BBS’ (Bulletin Board Systems). The original ECD proposal dates from November 1998, with a revised proposal presented in September 1999. The Directive then finally got adopted in May 2000, and entered into force in June of that same year. The section on the liability of intermediary service providers (section 4 – Articles 12 to 15) was motivated by developments on the international scene. The US had already enacted protections for intermediaries in Section 230 of its 1996 Communications Decency Act (CDA), which the Electronic Frontier Foundation still describes as “one of the most valuable tools for protecting freedom of expression and innovation on the Internet”. Later in 1998, the US set the blue prints for the notorious Digital Millennium Copyright Act (DMCA), creating the so-called ‘safe harbour’ regime under Section 512, protecting intermediaries from their users’ infringing activities. This instrument also entered into force in 2000. In the second half of the 1990s, the EU thus felt the heat of the US moving forward with creating a favourable environment for the development of online businesses. In order to ensure its competitiveness in a globalising world at that time, the EU had to step up its game. In its 1998 ECD proposal, the European Commission recognised the need to clarify the responsibility of online service-providers’ responsibility regarding the transmission and storage of 3rd party content. The final text of the ECD stressed that the “legal framework must be clear and simple, predictable and consistent with the rules applicable at international level so that it does not adversely affect the competitiveness of European industry or impede innovation” (see Recital 60), ensuring that online platforms would not have to comply with diverging national rules of 15 Member States at that time. Graham Smith, Partner at law firm Bird & Bird and focussing on IP and IT matters, explains that the ECD is “technology-neutral and business sector-agnostic”, and observes that this has been a flexible legal instrument, as he notes that “by focusing on activities defined in a technology-neutral way the Directive has transcended and adapted to many different evolving industries and kinds of business”. 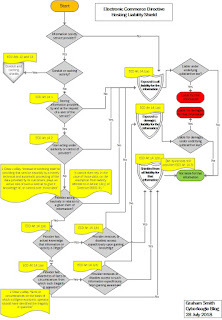 See his flowchart explaining the hosting liability protection. During the last decade rightholders have turned to the courts in their attempt to sink the ‘intermediary liability’ regime granted to online platforms. The Italian courts have played a hand in this, as they exploited one sentence in Recital 42 of the ECD to create a substantial distinction in the application of liability between ‘passive’ and so-called ‘active’ hosting providers. This ‘passive’ v. ‘active’ distinction first popped-up in the proceedings launched by ‘Reti Televisive Italiane’ [RTI] (since then acquired by Mediaset) in 2008 before the Court of Milan against Yahoo! for copyright infringements. It took until 2011 for the Court to issue its judgement, which found Yahoo! liable, as the Court considered them an ‘active’ hosting provider, and therefore not eligible for the ECD’s safe harbour protection. Yahoo! appealed this decision, and finally in 2015, the Court of Appeal of Milan overruled the prior judgement, as it found the Court’s earlier interpretation that created a distinction between active’ and ‘passive’ hosting providers was misleading, and observed that this distinction was not envisaged in the ECD or the Italian legislative decree implementing it. Note the length of these legal proceedings (2008 to 2015), and bear in mind that this legal uncertainty would have equated to a death sentence for a startup. Fast-forward to the summer of 2018, when the Vienna Commercial Court ruled in favour of the Austrian commercial broadcaster ProSiebenSat.1 PULS 4, that initiated proceedings four years earlier against YouTube about alleged copyright infringements on its platform. The Austrian Court found YouTube to be jointly responsible for these copyright infringements, as it considered that YouTube was not a ‘neutral’ intermediary. The Court thus denied YouTube’s ‘safe harbour’ protection under the ECD. Moreover, it imposed on YouTube the obligation to ensure that no copyright infringing content is uploaded in the future [notice how this sounds oddly similar to the Article 13 #CensorshipMachine provision]. More recently, in September 2018, the German Federal Supreme Court referred a number of questions for a preliminary ruling to the Court of Justice of the European Union concerning YouTube’s liability for copyright infringements committed by its users. Mid-January 2019, another Italian court decision made the headlines, as the Court of Appeals of Rome ordered Vimeo, another platform hosting video-content, to pay RTI an 8.5 million euros compensation for failure to take down uploads of TV shows, which infringed RTI’s copyright. Here again, the Court of Rome waved away the liability provisions of Vimeo based on the consideration that the platform plays an ‘active’ role, by ‘cataloguing, indexing and commissioning’ content, and therefore cannot benefit from the ECD’s safe harbour protection. However, the Court did not limit itself to just granting RTI compensation: it has also imposed on Vimeo the duty of care to pro-actively prevent new uploads of unauthorized content. If Vimeo fails to do so, it risks a 1.000 euros fine for each infringement, and on top of that they have to pay 500 euros per day that the content remains accessible on the platform. This last obligation is close the one imposed by the Vienna Commercial Court, but on steroids if one considers the looming financial penalties for Vimeo, which goes even beyond what is being discussed with regards to Article 13. It is interesting to note that fines are being imposed on the platform for future infringements, whilst we observe that copyright infringement claims can be filed gratuitously and that abusive claims often remain unpunished, as discussed in our earlier 2019 Copyright Week contribution. Platforms have been navigating some rough waters, as rightholders have been seeking to erode their safe harbour privileges for some time now. Legal proceedings however have been slow and deliver uncertain outcomes for both parties, although the Courts seem more often than not to side with the rightholders and often go above and beyond the law in their interpretation of it. These lengthy proceedings made the rightholders bet on a two-pronged approach: next to seeking legal remedies through the Courts, they also decided to persuade policymakers of online platforms’ ‘active’ role. This approach has proven successful for them, as some legislators bought into the rhetoric. This can be observed at various levels, from UK Prime Minister Theresa May’s 2018 Davos speech, wherein she noted that “platforms are no longer just passive hosts”, up to the statements by the EP’s copyright reform Rapporteur, German EPP MEP Axel Voss, who commented in September 2018 that: “Huge American platforms make money whilst our creatives die out. This is why we have to strengthen their rights and make platforms responsible”. However, what’s actually at stake here has less to do with actual creators, as they often no longer own the rights to their own works, but is rather a battle wherein big American rightholders are trying to sink big American online platforms, to the detriment of everyone else, be it citizens, EU startups, and even creators themselves, as this video highlights. This battle between these giants is bound to have severe implications for the Internet as we know it. they would refuse to carry any package that would even remotely look suspicious to them (liquids, for example, as it could be perfume, but also something dangerous). These carriers would only trust packages from large firms with whom they have negotiated deals that provide that they would take over the burden of any responsibility for potential infringements. These claims are being downplayed by some, including the European Parliament’s press service, who wrote that “the draft directive however does not specify or list what tools, human resources or infrastructure may be needed to prevent unremunerated material appearing on the site”, even daring to emphasise that “there is therefore no requirement for upload filters”. Indeed, the negotiators are trying to trick everyone (including their colleagues who don’t keep a close eye on this file) into believing that this is not about filtering by avoiding any explicit reference to it. However, that does not mean that filtering is not implied, as is the case. The simple reason for this is that human intervention to analyse and assess all the content being uploaded on platforms would basically put an end to the fact that users can instantaneously create, upload and share content. 950 blog posts being published on WordPress. The sheer volume of content being uploaded onto platforms every second leaves them with no other option than to implement automated filtering solution to mitigate their liability. Not mandating filters explicitly is just hypocritical, and prohibiting them whilst imposing a direct liability is just foolish. Rightholders have discovered that involving policymakers in the debate has perhaps not yielded the result that they had hoped for, because while on the one hand Courts try to be precise and nuanced, on the other hand, policymakers live in a world of compromises, which means that layers of complexities keep on being added, with the risk of creating a monstrosity that no one wants in the end and that is practically impossible to comply with. This led some players from the creative sector, mainly the audiovisual, to break rank and call upon policymakers ahead of the 21 January 2019 trilogue to suspend the negotiations on Article 13, as they are concerned about the possible collateral damages. At the same time, some EU policymakers are starting to slowly realise that they have been tricked into supporting something that isn’t what it claims to be, and are starting to regret their decision. Therefore, the most sensible option for now seems to be to delete Article 13, and wait to see how Court decisions move forward. Should legislative intervention be needed in this area, then policymakers should go back to the drawing board, and frame this as proper enforcement measures that fit into the context of the ECD, instead of trying to bypass and rewrite it for copyright infringements. All this should be conducted with thorough impact assessments, whilst involving more than copyright lawyers representing big businesses. If you want to #SaveYourInternet and help #DeleteArt13, go to https://saveyourinternet.eu and take action through EFF’s tools helping you to reach out to your national Government representatives.